If you’re considering raising your family and having your kids attend schools in the Central York School District, CENTURY 21 Core Partners has many attractive homes for sale in the area. You’ll find a wide variety of spacious single-family suburban homes throughout Manchester and Springettsbury Township. The attractive homes in North York Borough are ideally suited for families who prefer a small-city living environment. You’ll also experience the superior customer service you would expect from a leading Century 21® franchisee. The Century 21® brand received the highest numerical score from first-time and repeat home buyers in the J.D. Power 2014 Home Buyer/Seller Study. The Central York School District covers a 25-mile, largely suburban area in South Central Pennsylvania. The district serves the educational needs of students residing in North York Borough, Manchester Township and portions of Springettsbury Township. More than 5,000 students in grades K-12 currently attend the district’s five elementary schools, middle school and high school. Students benefit from a challenging and enriching educational experience. In terms of test scores, the district compares favorably to other districts in Pennsylvania. For Central York High School students who took the SAT in 2014, the average verbal score was 498, the average math score was 519 and the average writing score was 488. For students in the rest of the state, the average verbal score was 497, the average math score was 504 and the average writing score was 480. 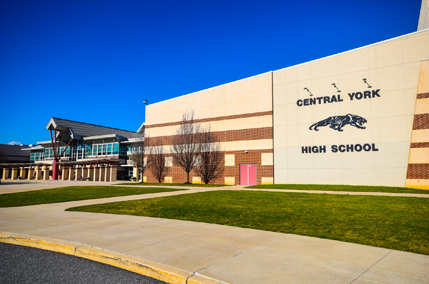 In the 2014 Pennsylvania School Performance Profile, Central York High School achieved a ranking of 86.5 out of a possible 100. Moving to the Central York School District can be a great idea for your family. There are a number of beautiful homes available here in an area with the atmosphere of a suburb and the conveniences of an urban environment. If you’re thinking about a Central York, PA relocation, this useful guide can help pave the way. One of the nice things about a Central York, PA relocation is you’re never far from a bank. There’s a PNC Bank on 2300 South Queen Street, a First National Bank on 135 North George Street and a Wells Fargo on 1461 Loucks Road. There are also several banks along East Market Street. Grocery shoppers in Central York, PA will probably want to take advantage of one of several GIANT Food Stores that can be found in the area. There’s one on 205 Glen Drive, one on 2415 E. Market Street and another on 1255 Carlisle Road, all open 24 hours. There’s also a Food Lion on East Market Street, a Save-A-Lot on Mt. Rose Avenue and several other grocery markets to choose from. The major shopping center to head to in Central York, PA is the York Galleria Mall on 2899 Whiteford Road. Surrounding the mall are retail stores like Kohl’s, Target and Sears. The mall itself houses such shopping establishments as Bath & Body Works, Pier 1 Imports, Staples, Spencer’s Gifts and lots more. The Galleria Mall is also the stop for just about any kind of food you’re in the mood for. For a casual meal, the mall offers a McDonald’s, Sbarro’s, Subway and Taco Bell, among others, and if you’re in more of a sit-down-and-relax mood, there’s a Longhorn Steakhouse, Chili’s and a Red Robin. If you’re looking to get away from the mall, there’s Central Family Restaurant on 400 North George Street and Meadow Hill Family Restaurants on 2935 E. Prospect Road. If your puppy needs a place to run free, you’ll enjoy John C. Rudy County Park on 400 Mundis Race Road, where you can take him to Canine Meadows. Your other park options include Rocky Ridge County Park at 400 Deninger Road, which features a ballfield, playground and hiking and biking trails. Springettsbury Township Park on 1501 Mt. Zion Road provides opportunities for myriad types of outdoor recreational fun. Central York, PA features a variety of fun events year round, from sporting events to concerts to fireworks. One summer event that’s not to be missed is Saturday in the Park in late September in Springettsbury Township Park. This award-winning event features athletic events, carnival games, all kinds of culinary delights, live music and more. In the winter you can walk around Rocky Ridge County Park looking at a wonderful display of Christmas lights. You can get instant access to all of the CENTURY 21 Core Partners Central York School District real estate listings by visiting our user-friendly website. Check out the high quality photos and take a virtual tour of the properties that interest you. You can also request a showing online, or use the affordability calculator to determine whether a specific home fits your budget. And don’t forget to download our mobile app to your smartphone or tablet so you have the latest property information no matter where you go. While technology plays an important role in today’s home buying process, real estate is still a people business at its core. CENTURY 21 Core Partners agents are committed to making purchasing homes in the Central York School District as easy and stress-free as possible. We want you to view your agent as your trusted advisor who is there to guide you every step of the way. We’ll help you navigate the often complex transaction phases such as making and negotiating an offer, obtaining financing and closing on your new home. You’ll also be able to focus on preparing for your big move. To learn more about locating and purchasing homes for sale in the Central York School District, call the York County real estate experts at CENTURY 21 Core Partners at 717-718-0748 today. To contact us online, fill out our contact form and you’ll receive a prompt reply from one our agents.